This season, Hanna Touma presents in his collection a range of delights of thousand tonalities. Skillfully made combinations of Muslin, Organza and lace delicately worked to fit women's bodies with range and elegance. To mix metal and silk with intricate heading or leather and lace with precious Crystals is to combine the aspects that reflect today's woman: her present, her History and her Beauty. Hanna Touma Couture ... A modern Fairy Tale. Fashion designer, born in Beirut on the 1st of January 1973. She is the daughter of famous haute couture icon Hanna Touma. Growing up in a "couture" environment, she was early interested by all shapes of art, especially sketching and painting, She spent her school days at "l'école des sœurs de Besançon". At the age of 13, she sketched her first dress, so impressively that it got executed, and sold soon after in her parents' atelier. 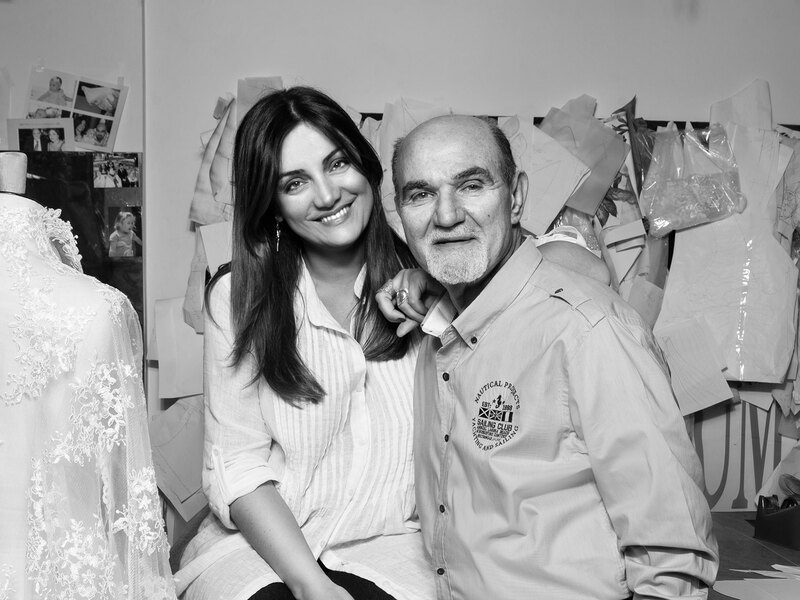 Since then, she began creating dresses and accessories for her dad's fashion house. In 1991, choosing her college major, she went for her second passion and joined ALBA (Académie Libanaise des Beaux-Arts) for an interior design degree. It was during her university years that she met Fady Jarjour, her class mate, who will years later become her life and business partner. She graduated with honors in 1996. She got her training in many interior design offices, and remodeled Hanna Touma couture's atelier. A couple of years later, she joined ESMOD, the famous French fashion school. In June 2001 she received the "1er prix de modélisme" and graduated with honors. Shirine started her design career with a huge success of her 1st Haute Couture collection for Hanna Touma. She went into the fashion world with a motto: "La Couture, c'est la conquête du detail". Their first defile took place in Beirut in 2002. Shirine enjoyed establishing new trends in the Middle Eastern fashion world, such as dresses made of metal, apparent "baleines" and other materials strange to haute couture, keeping though her father's conviction, that haute couture dresses should always be comfortable wearing. She mixed metal and silk, leather and lace with precious crystals to reflect today's woman, giving perfect attention to detail and finishing. The international fashion critics were brought to two words: Exquisitely striking. The positive vibes brought by her designs to Hanna Touma Couture's house led the team to exhibit their collections on the world's most prestigious runways. The Carrousel du Louvre and Westin hotel in Paris, as well as famous fashion events in Montenegro, Belgrade, Dubai and Beirut, all gave the "father-daughter" tandem an international renown. All collections were inspired by Shirine's poetic spirit. "Orangerie en fleurs", "Ainsi soit-elle", "Délices d'hiver", "Océane"... To complete her themes, she went into all the fashion shows details, and lived with the concept, creating with her husband all the aspects of the production, from the runway "décor", to lighting and music... etc. Here too, she was a pionner in the Arab world of fashion design, inviting people to "live" the fashion experience differently. 2008 witnessed the birth of "Miss T", the prêt-à-porter label of Hanna Touma, displayed in many brands boutiques in Beirut, and recently in Monaco. She shares with her sister and two brothers the ambition of expanding the brand to New York, Italy and other fashion capitals, in the near future. Shirine has also a parallel path. She never let go of her love for interior design. Supported by her husband, she worked on designing houses as well as corporate projects. Their refined taste led people to trust them designing interiors in KSA, Abu Dhabi, Amman and Beirut. Despite the notorious flashy aspect of the runways, and the glamorous world of interior design, Shirine leads a simple and unsophisticated life. To cope with everyday's unrestrained rhythm, she, her husband and their two daughters, Chloé and Océane, seek for calm in the relaxing Lebanese nature, and enjoy both the sea and mountain excursions. She loves taking her family on travels, where her daughters can acquire what she loves most: culture and the sense of adventure. Innovation, creativity and magnificence, are the common points to all the masterpieces of Shirine Touma Jarjour, both in the fashion and interior design world.